When I recently showed off my Head Over Heels quilt you asked for a tutorial and I finally got around to writing something up. This is not so much a tutorial as a how I did it. 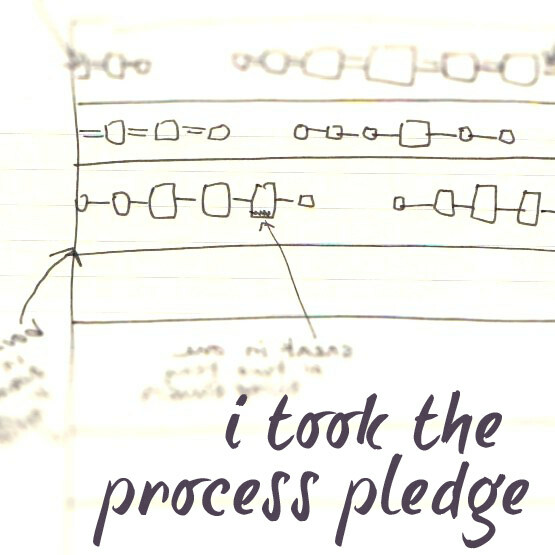 If you missed it, you can read more about it here. Seeing how charm squares usually come in packages of 42, that works out perfectly. Otherwise swapped charms or even working from your scrap basket is viable option. This is my story and how I did it using Liberty of London swapped charms. 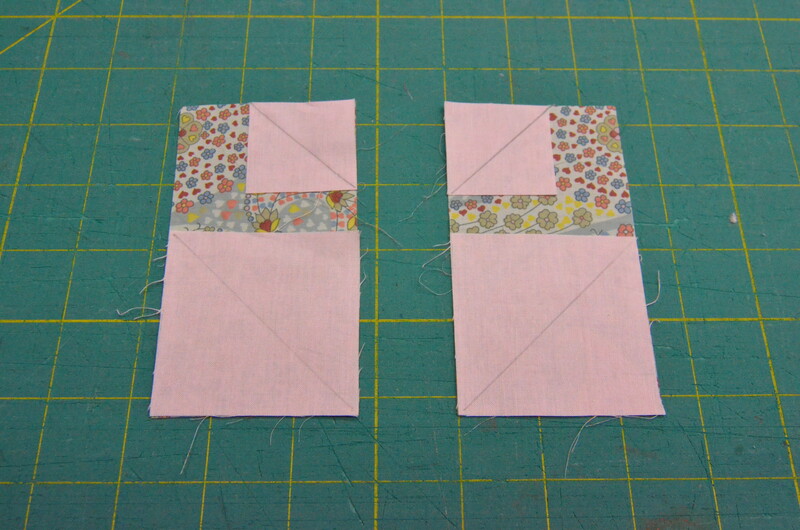 I started by cutting 1/2″ off the top of each square. 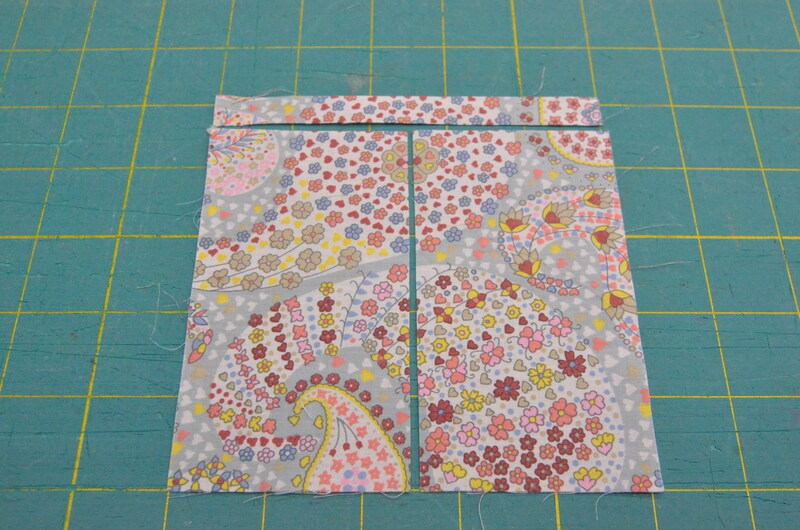 Then cut down the center of the remaining piece leaving you with 2 pieces 2 1/2″ wide x 4 1/2″ tall. 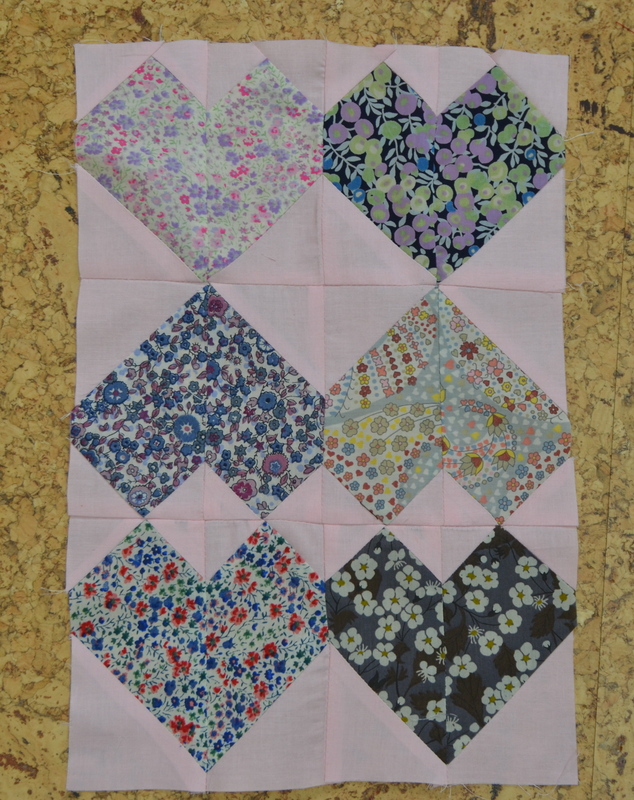 Giving you a total of 162 large squares and 324 small squares, for this size quilt. 12-13 ~ 1 1/2″ strips, depends on how many you can get from your width. You can always cut as you go, like I usually do, which is the reason I’m doing math, after the fact…. And if you want it larger, you do the math. Let me know what you come up with! Align the squares, on to the rectangles, as such. I find it easiest to use a pencil and draw stitching lines, from corner to corner, to keep everything straight. Trim the triangles off and then pick sides. Press the right side toward the heart and the left side away from the heart. Or vice versa. Just be consistent. Or you could press them open. Your choice. 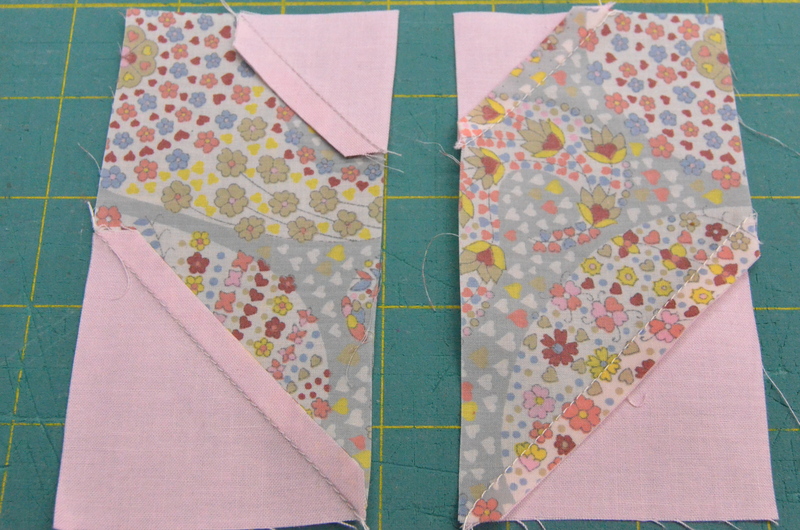 Stitch the halves together, aligning the seams. Then press consistently toward one side or the other. 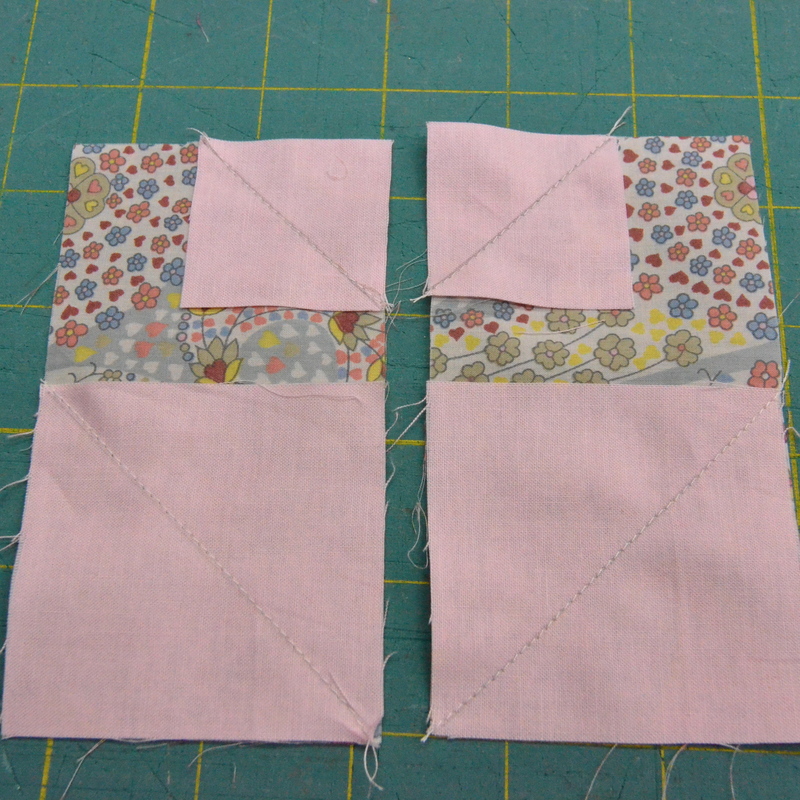 Now add another of the small squares to each upper, outer corner the same way you did the inner corners. Tada! Congratulations, you have finished one block! Now continue on another 80 times. Lay out your blocks, alternating rows, as pictured above. Add your binding, label, wash and snuggle. Let me know if you have any questions. And if you make one I would be tickled to see it! If you need help with baby snuggling, I can help there, too! I would be remiss not to mention that tomorrow starts Blogger’s Quilt Festival!! 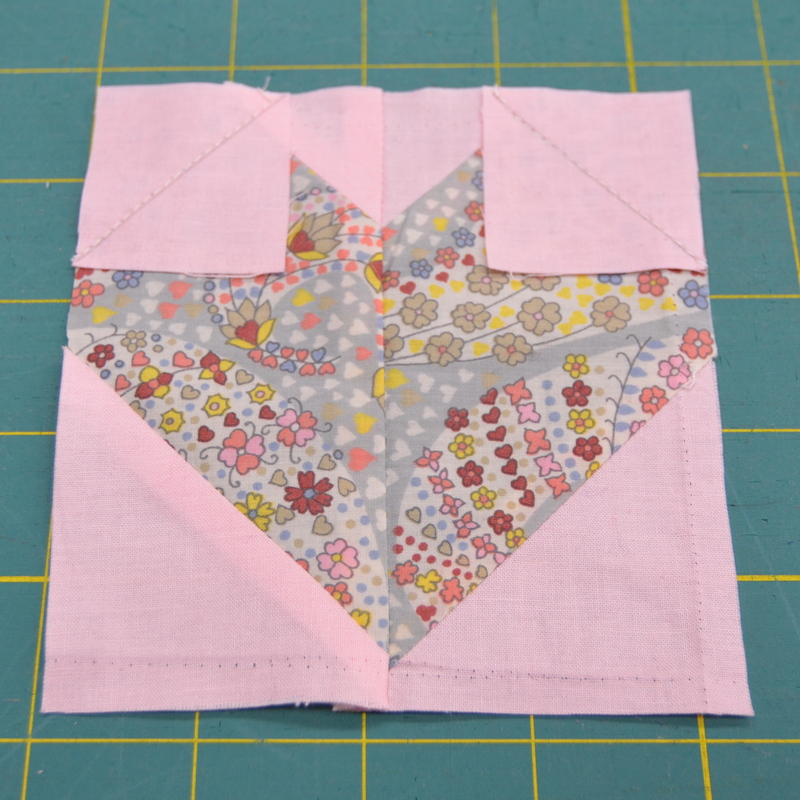 Hosted by Amy Ellis, of Amy’s Creative Side, it is the online quilt show open to anyone who loves to quilt and enjoys blogging about their creations. It’s a great place to find new and interesting blogs to follow and possibly gain some new blog followers. It is very inspiring to get so much positive feedback, on your quilts, all at once. Prizes awarded for entering your own quilt and for nominating your favorites. You can start linking up tomorrow through November 8. Come join the fun! For complete details head over to the Blogger’s Quilt Festival page. Hope to see you there!! 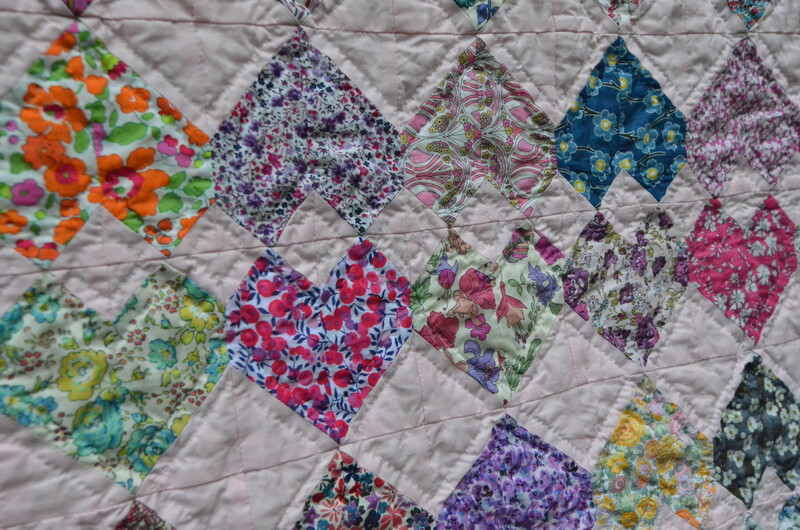 This entry was posted in 2013 completes, fabric, Family, hand quilting, Liberty of London charm swap, Quilting, Sewing, Tutorial and tagged baby, charm quilt, diy, fabric, girl, hand quilted, how to, Liberty of London, pattern, pink, quilt, tutorial. Bookmark the permalink. 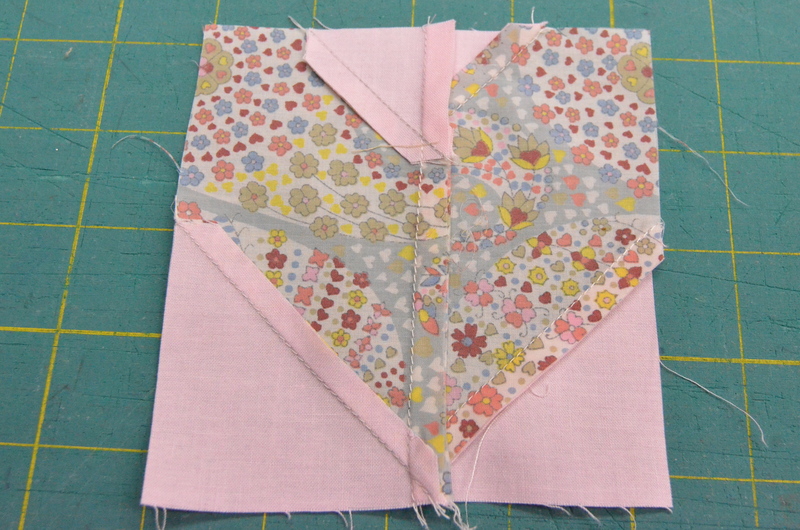 Just wondering does another square go on each outer side of the heart. I really like this and think this will be my next project. One large square on each outer bottom of the heart halves, and one small on each upper, inner heart half and yes, outer upper heart half! Try it with some scrap fabric and see if it makes more sense than how I drew it up! Thanks for the “how to”! This quilt is in my “to-do” list and I hope it’s soon! Let me know how it goes! I’ll be watching for it! Thank you for taking the time to post this how-to. Great tutorial! And that baby… so sweet! 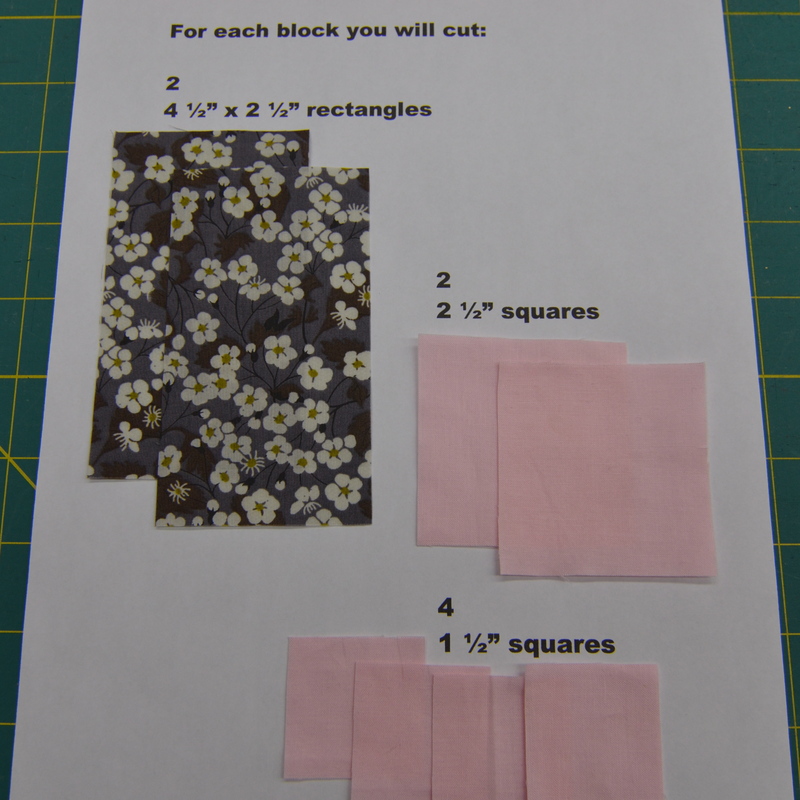 I just started cutting out the rectangles and squares. going to make it huge enough for a couple of newlyweds to cuddle in together, using their wedding colors and making an embroidered block with their names and date, etc. I think I may use the slogan “Head over heels in love” in the embroidered block. 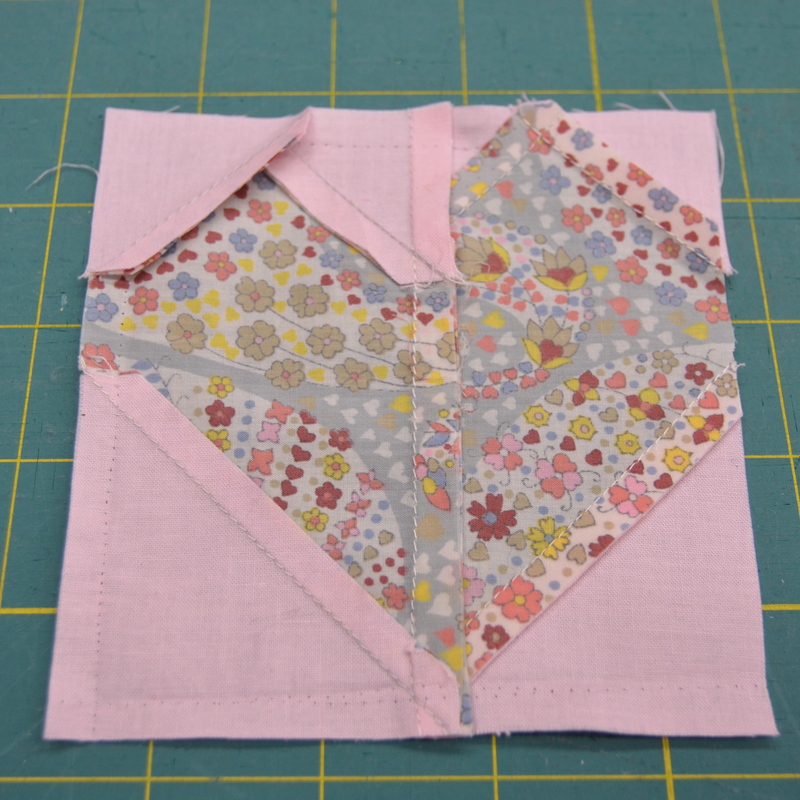 one note, not sure if my eyes are playing tricks but your finished quilt does look like a small triangle was used to curve the outer top of the heart, whereas the sample 4 blocks don’t. I like it both ways. Gayle! You are so right! I missed another square in the corner on the tutorial! It was another 1 1/2″ square. This is why I don’t sell my “how-to”!! It is corrected, now! Thanks for the feedback!